I have been dragging my feet since January. No blogging, no serious training, no real motivation. There are heaps of research explaining what is happening after a successful ¨ A ¨ race. A drop of motivation is absolutely normal. This is not the difficult part for me. What I find hard, is how to get out of this groove. It usually is an external factor, that gets me out of it. 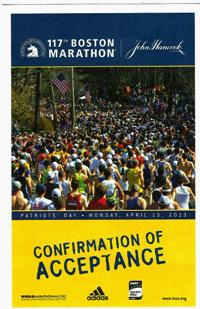 I thought the receival of the confirmtion of acceptance to the Boston Marathon would do it, but it did not really. I continued to drag my feet and train out of routine, out of specific work-out plans, out of structure. It is only after the recieval 10 days ago of my official Boston Marathon Athelte passport that the motivation kicked back. Great! I am back at it…but….but with these months of unstructured training my body is not the one it was only 3 months ago. Less mobility/flexibility, less strength, less speed, more nagging little pains… The negligence spread to maintenance of the equipment. My only usable running shoes have over 800 km. Not surprisingly, I exposed myself to injury. And, ding-dong, here it came. Three weeks ago I started to feel some quads pain. I ignored them and ran further. I cannot feel the pain during training but afterwards, it is there and intense. My therapist says it is an ¨ awakening ¨ of the quads still somewhat atrophied from the crash I had 4 years ago. Regardless what it is, it is frustrating to have my motivation back, but realising that I cannot feed it with a fit body. Yes, I ran 89 min at the half-marathon in The Hague 3 weeks ago, but it does not mean that I am marathon fit, even less triathlon fit. I am now 2 weeks before Boston, sitting in our Chalet in Saas-Fee and enjoying doing nothing, hoping that doing nothing will heal my quads. At least, now I look at these pictures and they talk to me, they say. Get back where you belong, in the world of acceptance, satisfaction, strength, high energy and good rest. – A good training plan (the first I found that suited my needs) . – A friend that wrote in his blog that he wants to beat me. The training plan: Ever heard of FIRST? The Furman Institute of Running and Scientific Training. I probably would never have, as I am not a runner and I do not read any running magazine like Runners World. It is my friend and fierce competitor who suggested it to me. “The Less is More” training plan. Clearly something for me. It is basically a 3-run-a-week plan, but the sessions are tough regardless whether it is intervals, tempo and long. This training plan pushed me to complete five 32km runs (at a increasing tempo but still below marathon pace). This has in my view been the key to manage my negative splits and build marathon specific endurance. The training group: I sadly have a track record of training mostly solo. I don’t like it, but so far I did not find a group that suited my needs and with whom I could harmonize well. This group I met (all dads bringing their children to the same international school in Wassenaar), was not only a group with a matching pace, but also with a good chemistry. It became “nearly” fun to wake up 2 times a week at 05:30 to compete our sessions in the dark. The weather in The Netherlands does not motivate me to go out. Without them I would never have trained as hard..and I would never have gone to Prague to run the marathon either… Sunday’s performance was all thanks to them. The friend that wanted to beat me: Richard (alias The Silverback) is a Runner with a big R. In his view there is no other sport that is greater than running. Triathlon is a diluted version as technology comes in the way..For him running is pure, simple and addicitive. After coming back from knee surgery, his mind was set to recover strength, speed and endurance. We saw him pushing himself over the months, sometimes to the point where I thought he would not make it to the start of our marathon. But came May 15th, he was as ready as one could be. We ran 32 km together, like we always did during our training sessions; starting slow and progressively picking up the pace to ensure negative splits. We did nothing else on that day. The aid station after km32 marked the point where I left my friend – The Silverback behind me. I did not slow down to pick up my drinks and came out first out of the aid station. Usually richard would catch-up and we would run side by side until the next aid station (every 5km), but I did not see him this time. I looked ahead to see, ifIi had missed him passing me, but no. I did not look back and picked up the pace by around 10 sec per km. My legs felt good and I knew I could do the fastest 10 km of this marathon (I did them in less than 44min) – The question I will never be able to answer is whether I kept too much in the tank before the last quarter of the race). I am paricularly happy about the negative splits results. 1:37:47 for the first 21km and 1:34:50 for the second half-marathon. 3 min faster! Needless to stay that I felt great for the entire course until km41 where my heart reate was clearly in the red and my system felt like an engine without oil. But I was so happy to have improved my running in the last 6 months that I clenched my teeth and motored my way to the finish chute. True joy at the finish line. I waited about 2 min to see Richard crossing the finish line in 3:14:27. He was over the moon. We both finished under the qualifying time limit to participate to the Boston Marathon. In the US they call such a result a BQ (Boston Qualifier). I have until September to think whether I will get a plane ticket to run over in Boston or not. It could be really fun and motivate me to further improve my marathon time. I loved that race, not only because I performed well, but first and foremost because I was there with Richard, Joel & Jim with whom we shared so much (trash talk) during our training sessions. Jim did not run on that week-end due to sustained foot injuries. It was hard for us, but even harder for him. He supported us the best he could, hiding his own disappointment and shouting at us during the course the we were looking good. We all knew it was a lie, but it did work wonders… Joel, did run after having recovered from his injuries. But he raced without have run for 7 weeks…His time is not important, but he can start writing books now. “how to run a marathon without training” or “training for a marathon is overrated”….or… “A week-end to remember”. In my head there are 2 big races in 2012 among the 8 or 9 that I will do. 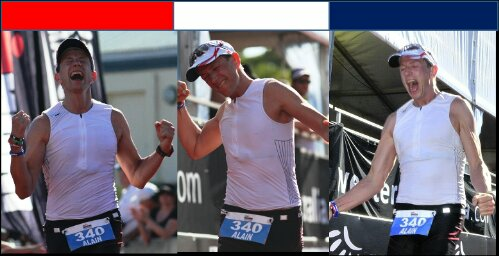 Prague Marathon & IronMan Western Australia. A marathon is usually more a preparation race than a milestone, but this time I am competing against friends with whom I have trained for the last 5 months. Prague is the show down. 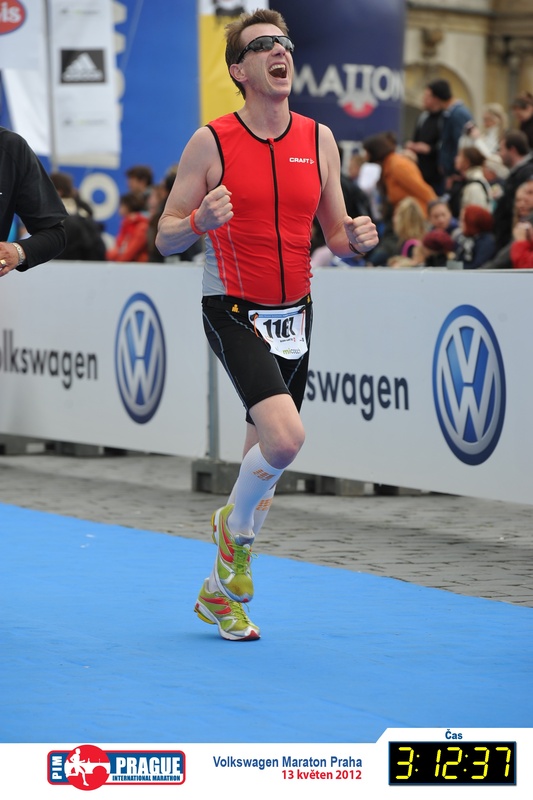 Before May 13th, day of the Prague Marathon, I decided to participate to 2 short racing events: A Sprint-Duathlon on March 18th and the Business Marathon Relay in Rotterdam on April 15th. On the day prior to the Duathlon, one of my training partners asks me, if I can come along to support. I amsurprised and enthousastic about it. I cannot remember a time, where someone spontaneously asked to support me for a race. That gave me some additional motivation. I really needed that motivation on Race Day: cold, windy, rainy, muddy. About 100 participants on the starting line. All looking rather fit. I race the 5km run – 20km bike – 2.5km run in 1:05. Rather happy with the performance actually. a 4:00 pace-ish on the run and a 34 kmh avg on the bike…but I finished 22 of 50 in my age group…I cannot remember racing and finishing in the 40 percentile…ever. Conclusion: stiff competition. The second race was more a social event. My relay partners were all working colleagues. It was a challenge I proposed to my team: get fit in 4 month and run the marathon relay in Rotterdam. Our team did very well on the 15th of April. We ended as 2nd team out of 28th from our company (only 45 sec behind the first team) and 13th out of 518 business team participating. Out time: 3:07. Great team effort. I enjoyed the day as one of the 116 colleagues from the company who ran on that day. I ran the 3rd leg in 51min25. It was about 12.7km, meaning I ran again around the 4:00 min/km pace. Happy with that. My speed is better than ever before. Still a long way to go until IM Western Australia; but a good start. An early wake-up call on a Sunday is usually something I loath. But today is Marathon day! Eyes wide open, I jump out of the bed, morning stretch, warm shower, down to the breakfast hall. 1 banana, 1 Supradyn tablet diluted in 1 liter of water, lots of Wasa bread and butter. It is a perfect day. Sunny, 8 degrees at 09:00 AM, wind not exceeding 15km/h. Together with Isa we go out of the hotel 30 min before the start and run to warm-up to the starting line. I expect pushing and shoving (as you would when you see traffic jams in Italy). But no, the atmosphere is very relaxed. Nobody is too excited to be under the starting arch, people chat loudly, laugh, give enough space for the other competitors. In total 1’000 relaxed participants to the 12.3km, the 30km and the 42.195km races are lining-up for a common start at 09:30 in front of the main castle of the city. The first 5km: A loud cheering and everybody starts running. And here again; no shoving, no hectic, no swear words. It is simply fantastic and I already enjoy the race. Well, I enjoy until I see my heart beat going 161 and my pace 5:20! What’s wrong with me? I feel great, what’s wrong? I keep asking myself for the first 22:30 minutes until I see the 5km mark. I relax, my foot sensor is not working. I feel like ditching my watch for good and forever. I decide to only look at the heart rate. What else can I do anyway? Until half-way: The first 15km are in and around the old city centre of Ferrara. Few spactators. The ones talking are anyway the Italian runners around me, as if they were on a short easy stroll. Amazing. I love it. Listening to the conversations and keeping with one group. The half-marathon mark is quickly passed in 1:40. The last 21km:At km 26, it is time to take my second Gel. I don’t feel the magic for the next 4 km. They are hard. My legs are suddenly heavy, I feel my pace going down. Goodbye dear negative splits! From km30 to km32, I pass a dozen runners and this cheers me up, I even motivate them to tag along. But the joy is of short duration. Km 34 is hell, carbs are out – fat is on. It takes me until km37 to adapt and suddenly: boooom. Afterburners are turned-on, I can smell the finishing line and I start running at a good pace again. Heart rate goes up to 172. A last small frustration at km39. A Sixty year old marathoner passes me with ease. But I keep to his heels. The last 500m:We run the last km together, 300m before the arrival, I see Isabel waving at me. I feel very happy, so close to the finishing line. I let my running companion pass me on the last 100m. I feel a huge respect for this man. The organisers have put a real red carpet. I see from behind this elder marthoner running on the red carpet and crossing the finish line. I have a big smile on my face and decide to jump as high as I can crossing the finish line. The landing is better left without comment. Isabel finishes her 12.3km in 72 min! And this without any training (I you consider Kung-Fu as only marginally helpful for running). I am very proud of her and hope that we will do some other training and races together. The remaining of the week-end includes, eating pasta, drinking beer, struggling to climb the stairs into the airplane and even more getting out and down the plane after landing in Vienna. It is late, Manon & Zoe are sleeping. Only Barbara our nanny is still awake. Great to have her with us. Without her, a lot would be different. Sunday, will be my first marathon since New-York ING in 2004. The Ferrara Marathon is scheduled very early in the year and fits perfectly my preparation schedule for the Switzerland Ironman on July 12th in Zurich. It is not only scheduled early it is also perfectly flat and has only around a 1’000 participants. I am looking forward to a hassle free run, even if this means very few spectators on the side of the road. I do not feel particularly well prepared. I got the flue a week ago and have only done a few long runs. Bottom line, I will go there and see what I can do. I am sure to take a lot of learning from the race. My last long run was on Sunday. 26 km or 60% of the actual distance. I still feel the training in the legs but I am sure to recover until then.